In stock -This product will ship today if ordered within the next 1 hours and 15 minutes. Quest L-Tyrosine provides 500mg of L-Tyrosine. Tyrosine is the building block for several neurotransmitters, including epinephrine, norepinephrine, serotonin, and dopamine. Thyroxine is synthesised from iodine and tyrosine. L-Tyrosine, Capsule Shell (hypromellose, Water), Bulking Agent: Microcrystalline cellulose, Magnesium Stearate. Take one to four capsules daily on an empty stomach. Swallow with water. Below are reviews of L-Tyrosine 500mg - For Energy & Wellbeing - 30 Capsules by bodykind customers. If you have tried this product we'd love to hear what you think so please leave a review. 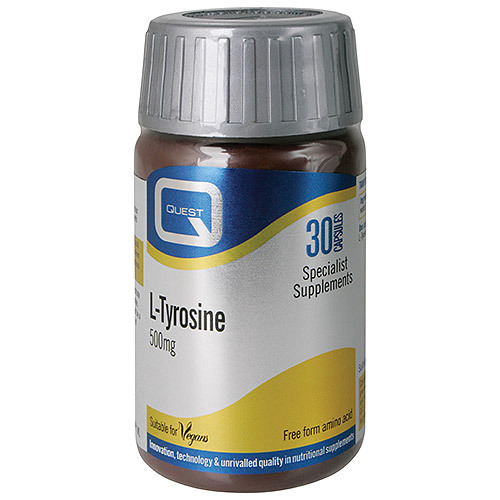 Quest L-Tyrosine provides 500mg of L-Tyrosine. Tyrosine is the building block for several neurotransmitters including serotonin and dopamine which may increase mental alertness. Use to support mental well-being and thyroid health.